I'm feeling much better after a day of rest and some herbal tea. Thank you so much for your well wishes...really made my day!! Sale-A-Bration started yesterday!!! For those of you that don't know, it's that time of year with SU! that when you spend $50 in SU! merchandise; you get to pick FREE GOODIES and what's even better is that this year they have Designer Series Paper and a Ribbon Bundle!!! If you haven't noticed by now, I'm quite the ribbon junkie so I'm all over the ribbon choice LOL! Just click HERE and shop your heart out....your order will be shipped directly to you with a FREE CATALOG too--how cool is that?!!! I will have a special bonus in March for every order I get this month....trust me, you don't wanna miss it!!!!! K, enough of the sales pitch...onto my card! I made this lil' cutie obviously because of how I was feeling LOL! I received this image on Friday from WISH RAK on SCS and thought she was adorable...had no idea I would be using her this soon though!! I wanted to use up some of my retired DSP so that explains my color scheme....had to throw in a bit of black too---I've found that it's wonderful to use as a color balancer. I also added crystal effects to the needle...thought that it would give the perfect effect since it's supposed to be holding liquid medicine. I embellished the corners with buttons & brads, popped up my sentiment & threw in the ribbon---all done!!! Well, I need to get the kiddos ready for school so I better get to it & Mr. Brown is showing up today....soooo excited!!!!! Thanks so much for stopping by and I hope the rest of your day is great!!! Ooooo she is cute! And you really did a great job. Almost patriotic! I find black the perfect color balancer too...always have a stack of it around! :) Love your little nurse, she's soooo cute and I'm glad you're feeling better...it's going around down here too...I personally don't have it (yet), but know of several people that do. Glad you are on the mend! I bet you're on pins & needles waiting for Mr. Brown!!! It's always fun when he stops by for a visit!!! Oh my goodness, this is adorable! Super coloring and great color choices! This card just makes you smile. Hey, my comment has disappeared! I hope it is not doubled up somewhere. I am glad you're feeling better. And such a cute card. Cute! Just looking at that needle can make you get better fast! But seriously, glad you're feeling more the thing today! This is so cute, and I love that sentiment. Glad you are feeling better now. Blog candy over on my blog. pop over and see me.. The crd i socute! Gad ou're better, looks like your huseis almost as busy as mine! I like all the sparkly details. It sure would brighten up any sick person's day. 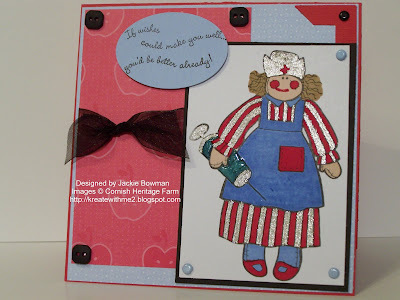 Oh, Jackie, I am so in love with this card!! It's great! So glad to hear you are feeling better today, Jackie! Your nurse is ready to do her dutey and take care of you should you need her! Great card and so well done! Glad you are feeling better today!! Cute card!! I'm with you and love ribbon. Its so hard not to add it to a card than not. Love that cute little image and glad you are feeling better.